Edge grinders polishing machines for edges. Suitable for small floors and confined spaces. Effective for grinding and polishing concrete and natural stone surfaces. Also for epoxy floors. Industrial floors. Resin floors. 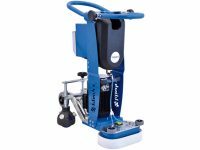 Equally suitable as floor cleaning machines on vinyl, ceramic tiles and other surface materials. All the Klindex machines on this page have a excellent choice of additional accessories. This assures you that the machine of your choice will have as wide an application field as possible. Thus maximising your investment in a high quality Klindex machine. For edges look at the Extrema a truly effective edge grinder and polisher. For small surfaces such as stairs or worktops have a look at the Waterfire hand grinder. For fast grinding away humps in concrete or extreme lippage on stone surfaces look at Minielle. Also an effective edger. For polishing in corners do look at the Klindex Minipower. A truly multi function design. Use of small surface machines improves health and safety regulations compliance.